Interview with Ray Kennedy from Retro Reds - LFChistory - Stats galore for Liverpool FC! 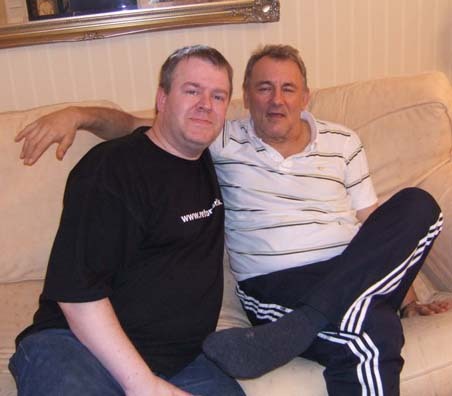 The Ray Kennedy story has been well documented in books, documentaries and numerous websites, so rather than repeat statistics that can be found elsewhere I will concentrate on today, my first solo meeting with Ray at his home in the North East of England. This interview with Ray Kennedy took place on March 24th 2008 at Ray's home during a memorabilia signing with Retro Reds. Ray greets me in person at the door and shakes my hand warmly and firmly. "Good to see you," he says. "Do you want tea?" I accept a glass of water as Ray clears a table for us to sit at and chat. I notice a giant glass replica European Cup on the table, inscribed with his name and the details of the 1981 victory over Real Madrid. It has a slight crack on one side. "The club gave us all one," he says. And chuckles. "I put it in the dishwasher - oops ! Too hot - cracked it. Never mind..." he taps his temple. "I have all the memories." I pull out my notebook but as the session progresses I struggle at times understanding some of Ray's answers. At times he slurs a little, but you would have to be a fool to underestimate the strength of mind of this footballing legend. He remains Razor sharp, mentally alert and quick to dispel any notion one might have had of him looking for sympathy. There is no self-pity and no hint of misery and it would be a foolish man to treat him any differently because of his illness. However, this explains why, when we start our interview, the continuity is not quite as fluent as it may have been under different circumstances. Ray signs a few shirts and photos for us as we talk. Emilio wants me to ask some more obscure questions rather than the obvious ones which he must have been asked a million times. Q: You trailed Astley 1-3 in the Blake Cup Final. Can you remember what the score was in the return game ? A : I can't remember to be honest... it was a long time ago. I think we won 2-0, maybe 3-0 though. I have a photograph of the team with the cup, I'll get it for you. Q : There are different versions of Stanley Matthews' rejection of you which were harsh. But when you met him again, how did you approach one another ? I seem to remember you showing off to him your European Cup Winners medal. Did Stanley ever show any remorse/regret ? A : Mr. Matthews was right. I was slow. Very slow. He could beat me in a race and that wasn't good for a striker. He was pleased that I did make it in the end. He really wanted me to do well and he wrote to my parents a lot.